Hartlepool Borough Council leader, Coun Christopher Akers-Belcher, is facing a vote of no confidence from within his own party. Grass root members in the Hartlepool Constituency Labour Party (CLP) have put forward a motion to be voted on tonight calling for Coun Akers-Belcher to resign as leader of Hartlepool Labour Group – the majority group of 18 councillors the party has on the council. Coun Akers Belcher claims he is being “bullied” out of his post and has pledged to fight the bid. The motion cites a host of alleged failings of the party’s group leadership which members fear will cost them votes in next May’s elections. The motion is due to be voted on tonight by the local party’s General Management Committee, the CLP’s decision-making body. It complains of a lack of communication with voters and a ‘growing disconnect’ between them and Labour Group policy which the CLP says have alienated the electorate including the increase of councillors’ allowances, and perceived ‘vanity’ regeneration projects. It also accuses Coun Akers-Belcher of failing to address ‘a growing tide of lies and deception’ directed at the leadership of the group on social media, or to tackle Labour’s political opponents on the council, which it says has created a widely held public perception of a virtual coalition. 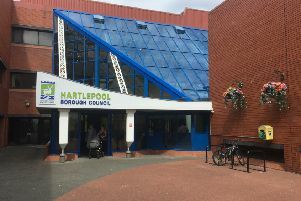 The motion also states that while Labour nationally has seen a rise in support in recent years, Hartlepool has seen a significant decline since 2012 – the time Coun Akers-Belcher became Labour Group Leader. The motion goes on: “As a result of the above Hartlepool Constituency Labour Party does not believe the current leadership of Hartlepool Labour Group has a sustainable future. “The party believes that the time has come for new leadership that can command the respect of Hartlepool residents. It also calls for an end to infighting within the party. Responding to the motions, Coun Akers-Belcher said: “As has been reported in the national media, there is growing concern across the Labour Party that bullying behaviour is resulting in some political leaders being subject to personal attacks. “I am incredibly disappointed that this too is happening in Hartlepool. “I am encouraged by the many messages of support I have had from people. “I believe that the National Labour Party and Labour North need to deal swiftly with this situation and put a stop to it. “However, I absolutely will not let this situation distract me from continuing to achieve the priorities agreed by Full Council for making Hartlepool the best possible place to live, work and visit. Even if constituency members vote in favour of the motion, it is councillors who decide who their group leader is. A second motion proposed by the Victoria Branch of the Hartlepool CLP requests that party officers urgently confirm that Labour councillors are not involved in any community or commercial activities that could, or could be viewed, as bringing the party into disrepute.